Dr. Matthew Shaffer is a Research Associate with Oak Ridge Associated Universities, a non-profit consortium of more than 120 doctoral granting universities. He has a B.A. in Psychology from the University of Delaware, a M.A. in Social Psychology from the University of Tennessee, as well as a Ph.D. in Industrial/Organizational Psychology from the University of Tennessee. He has a broad range of research interests, but currently focuses primarily on leadership and employee engagement related to nuclear safety and security culture. 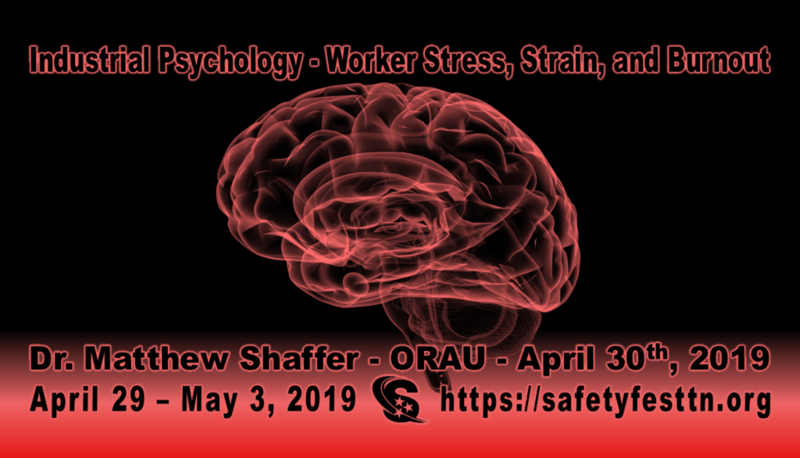 This presentation is intended to provide a brief overview of the industrial psychology pertaining to the study of stress for health and safety professionals. Health and safety professionals tend to focus on the physical elements of work design, such as ergonomics, when attempting to reduce stress and strain. While ergonomics play a key role, empirical psychological research includes a number of work design elements which can contribute to the reduction of stress and strain, as well. In this presentation, participants will learn about the industrial psychology field, how it relates to the study of stress, and how industrial psychological principles can be applied in the workplace with the overall goal of reducing the number of safety events related to strain or worker burnout.